Spectacular views of the lights of Santa Fe, the Sangre de Cristos Mountains, Jemez, and the western sunsets. 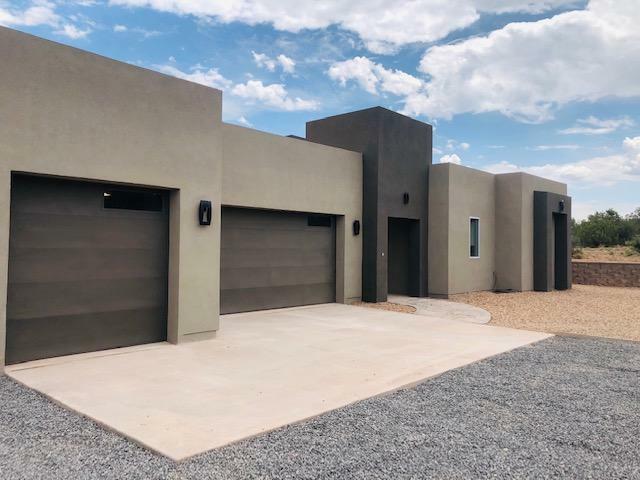 This newly built Contemporary home features a Bright, open floor plan with large sliding windows in the master bedroom and living room bringing the natural serenity of the unobstructed views into your home. The spa style master bathroom is stunning, with gorgeous light fixtures, large walk-in shower and large soaking tub with double sinks. An attached large Casita is perfect for in-laws or guests! A chefs kitchen with butler pantry, perfect for entertaining. This 3 plus acre lot borders a 4 plus acre easement. The home is currently being finished, allowing for some time to pick your own interior tile accents and fixtures.